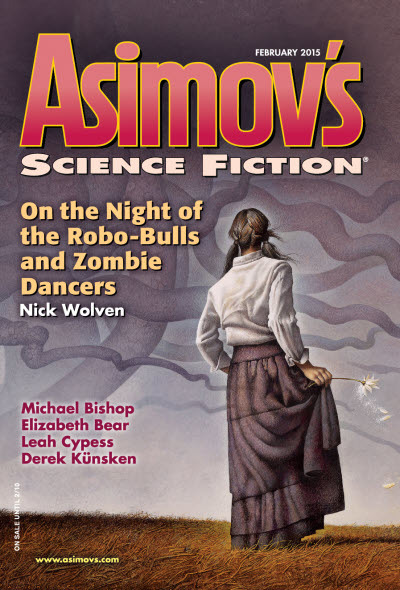 "On the Night of the Robo-Bulls and Zombie Dancers," by Nick Wolven [bio] (edited by Sheila Williams), appeared in Asimov's Science Fiction issue 02|15, published on December 15, 2014 by Penny Publications. Pro: There's a lot of symbolism here, and you pick up more the more you look at it. Gabriel, for example, is the angel who blows the trumpet that announces the end of the world. 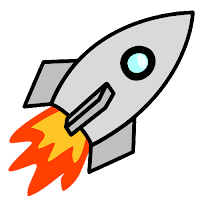 In this story, though, he journeys through a series of challenges, with his wife Marisol (a version of the Virgin Mary) giving him aid when he needs it. You can spend time trying to decide what each step in his journey means, or you can just enjoy the ride. It works either way. He finds that the holy hermit whose advice he sought is a madman, escapes him too, rejoins his wife, and finally sees the world as it really is. Con: Symbolic journey or no, it describes a place so broken it couldn't function at all. We're not really emotionally invested in Gabriel, so the ending hasn't got much punch.